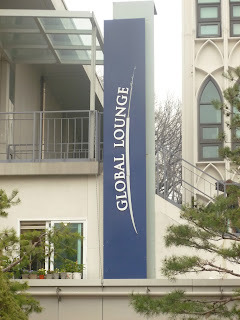 On my visits to three University Libraries in Seoul, I discovered that they all included a facility called the “Global Lounge” a space which provided cultural facilities and computers for overseas students. The PCs were set up in a number of languages (Russian, Chinese, French etc.) and the space could be used for Cultural exchange events and exhibitions. The Global Lounge at University of Hong Kong has been open since 2005 and it is a dedicated facility providing a range of amenities for overseas staff and students, although as I found out, it is popular with all categories of staff and students. At the entrance to the Global Lounge, there is a reception desk usually staffed by one or two people. At this desk you can get information on a range of things including information about the University, accommodation and general tourist information. However, it is also a first point of contact for University Admissions, both international and mainland. The Lounge it is located on the ground floor of a Student Accommodation building which has restaurants and canteens on the 2nd and 3rd floors with student accommodation in the remainder of the multi storey building starting on the 4th floor. Therefore, although not central to campus (it is on the East side) it is in a good location for easy access to students. Perhaps even more crucially, the International Office is located by and accessed through the Global Lounge, resulting in new staff and students visiting the International Office get to see the Global Lounge almost immediately when they arrive at HKU, and, as a consequence the space becomes becomes a natural place for staff and students to return to. Close to the entrance and reception area is a coffee bar providing a wide range of hot and cold snacks and drinks throughout the day, between 9am and 9pm, this facility is run by the University catering service not by the Lounge staff. The Lounge is a large, single space subdivided by furniture creating a number of zones. The most striking of these is the Media Wall providing a number of TV programmes running simultanously in a range of languages. Comfortable furniture is set out in rows for viewing, there is no access to the sound on these screens, rather subtitles in the appropriate language are played. In front of the Media Wall is a projector and drop down screen for the film shows. The largest area is a seating area with coffee tables, but actually, rather than the students using this furniture to “hang out”, there is a lot of work going on, with high use of laptops balanced either on the lap or on the arm of the chair. Around the periphery of the room, there are a range of smaller facilities including a study corner with journals providing information to students about opportunities for study and exchange programmes at Universities around the world. There are only 2 study tables in the whole venue, these are located in this study corner. I spoke to the group of students see above, who were preparing for some group presentations to be held shortly. They liked the space as it gave them the opportunity to work and talk without worrying about disturbing others, as they would for example in the library. They also like the fact that they could get food and drink which meant that they could stay and work for longer, they think it is one of the nicest places to come and work in. However, these were not international students, but students from Hong Kong. These students are rehearsing for presentations. There are two PCs available for general use, and whilst I was there, there were used a couple of times, but for very short periods. I visited the Lounge on Friday morning during an extremely heavy thunderstorm, at one point, the sky become as black as night and the rain became even more heavy (whilst writing this the extreme weather yesterday has just been reported on the BBC world news!) So, I was surprised to find these girls happily working outside! even the weather does not stop the studying! I went to speak to them, and they said that although the rain was heavy, they were still warm and in a sheltered spot, and that actually it was quieter than the lounge so they could get on with their work undisturbed, yet till pop in for tea etc. when they needed to. Because the Lounge is used in the evenings for a number of different events, there is not as much furniture in the space as perhaps would be possible to provide as there is a need to be able to clear the furniture into a corner to free up the space. As a result, the students resort to sitting on the floor to work, but I observed that several of the students chose the floor in preference to some of the seating that was available. The floor as a work surface! Another group of happy students working hard. And interestingly, this group of students (above) are also not international students, and this was the first time that they had used the Lounge for group study. They had passed the space a number of times, and because they needed a space to work as a group to rehearse (more) presentations, they decided to come in. They liked it very much and said they would return. The next group I spoke to were 3 PHD students one from the Netherlands, one from Kenya and one from Nottingham (!!). They think this is a really nice place to come for coffee and a chat, for the student from the Netherlands, this was her first visit and she likes it, but her immediate impression that it needs more furniture! As an aside, they felt that a problem for PHD students and other overseas students, was that there are no bar facilities for them or UG students on campus, and this would be a nice location for a pop up bar in the evening to allow PHD students to socialise after work for a short time. They can apply for access to the Staff bars, but felt that they need a place to be with their peers to network. Recently, the University surveyed students about a space that was to be refurbished to create new facilities for them, a bar was on the list of options, but the students chose by a majority to have a new Starbucks coffee shop instead. What is really interesting to observe is that students have no problem in squeezing into the smallest space available for them to sit in, whereas in the UK, I think that we would be looking to maintain “our personal space” much more. Also students now coming in to what is a very busy space are taking spare seats to create a new seating arrangement. The furniture is light and moves very easily, too easily really as I kept slipping between the seats, but managed to keep my dignity! Many students are simply using the space to have a meeting, classrooms in this university are locked when not in use, only opening 15 minutes before a lecture is scheduled to accommodate early birds, so ad hoc meeting places are not readily available, so this becomes a useful venue. So, the question is, are there any other spaces on campus available to students generally to meet, talk, collaborate or simply hang out? I met with the Head of AV later on and she told me that there are lots of places on campus for students to meet and work in groups, and ultimately, the students choose the places that best suit their needs. I am going to try to get to see some of these next week. The Global Lounge originally had a gymnasium which was located behind the Media Wall and which activities within could be viewed from the Lounge. The gymnasium was deemed not to be used effectively, so, as the International office was increasing in size, the gym has gone to make way for more office space. Other facilities in the Global Lounge include daily newspapers and resources categorised specifically for International Groups. The evening events include cultural evenings, for example this week there has been an Indonesian evening, two Burma evenings, a film show on the first night and the second evening being a food and culture session, there are also academic talks and active sessions led by the International Office. Throughout the time that I have been here (about 4 hours) there has been a cleaner working constantly to keep the floor clean from the water walked into the space and the bins emptied. Before I left, I spoke to a member of the International Office, and she pointed out that this Global Lounge is operated on similar principles to that of the Global Lounge at Yonsei University, a facility separate to the Library space and co-located with the Student Union. When I checked my photographs, I realised, I had in fact spotted it! This is a great looking building with interesting and comfortable looking spaces, much more like a student 'home' in which to work, chat or meet to discuss coursework. I like the nooks and corners, different seats, bookshelf graphic is that? You can tell there's not enough furniture, tricky thing to get right. Great pics Toni.